Trombone. Composed by Gordon Goodwin. Brass - Trombone and Baritone Method or Collection; Play-Along; SmartMusic. Gordon Goodwin Series. Grade 5-6. Big Band and Play Along. Instructional book (leadsheet notation) and accompaniment CD. With leadsheet notation, black & white photos, performance notes and solo transcriptions. 64 pages. Alfred Music #00-25253. Published by Alfred Music (AP.25253). ISBN 0739039687. 9x12 inches. English. 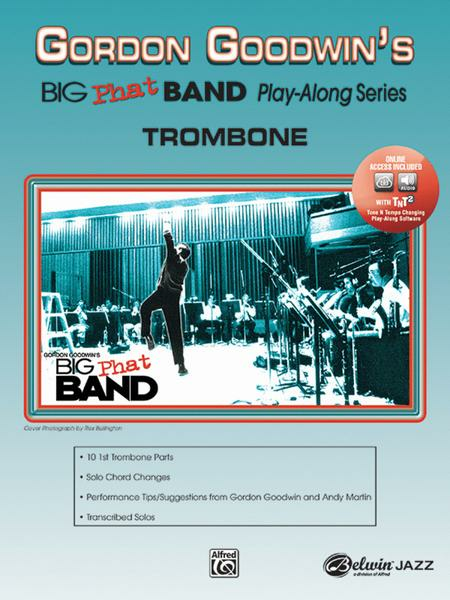 Gordon Goodwin's Big Phat Band Play-Along Series gives you the chance to sit in with the outstanding players in the Big Phat Band to improve and measure your own ability to play in a big band. The goal of this series is to teach the art of ensemble playing. 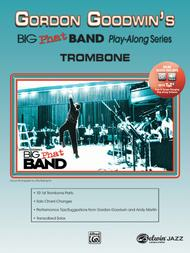 You will learn volumes of information about style, phrasing, tone, dynamics, technique, articulation, playing in time, Latin grooves, and a variety of swing styles as you play along and listen to the players in the Phat Band. This is one of the best play alongs I have. This is a full band with the trombone part left out for you to fill in. Much better than jamey aebersold. 43 of 72 people found this review helpful. Please understand that this cd and book set is so you can play with the band. This isn't like Aebersold, where you front the band. So- you'll sit through the rests like you would in real life. Don't buy if you want performance material. 54 of 101 people found this review helpful.